Do you think you could add partially powered redstone blocks? This way we can use them in memory devices that are more efficient. What exactly do you mean? Like a Redstone Block that give a signal strength of 7, rather then 15? I've used chests/droppers filled with stone shovels before to give a specific signal strength, but I don't see how that would be used in memory circuits. Currently, the most compact form of memory storage I'm aware of involves using stone shovels and water bottles, stored in sequence in chests. These items are non-stackable so its possible to uses hoppers/droppers to add them in a sequence, say Shovel-Bottle-Shovel-Bottle (or 0101 in binary) and then read that out, using a brewing stand to test for the bottles. This would allow for memory storage of 27-bits per block, or using Shulker Boxes, up to 729-bits per block. It might even be possible to go much higher by cramming chest minecarts if you can figure out a way to separate them back out in the same order in which they were crammed. Obviously this is sequential memory not ram. So the "Allow Crafting Tables to work with Hoppers" thing was causing some issues. Crafting table were untextured in my inventory, and, while they could be placed, didn't work properly. Right clicking on them to open them caused the crafting screen to open for a split second then close. Additionally, they could be broken instantly(tested in survival btw). Disabling the Crafting Table and Hopper thing in the config fixed the issue. Additionally, like mrtiago0564421 said, the pistons, dispenser and dropper have a similar pink texture. Both pistons look normal when placed, but their "plungers?" disappear when extended. Beyond that though they work properly. 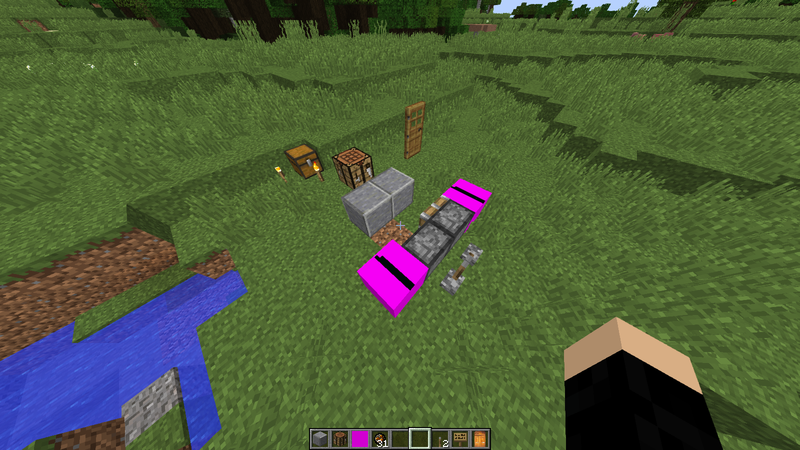 Dispensers/Droppers seem to work properly when placed, but still have the pink error texture. Blocks from left to right: Dispenser, Sticky Piston, Piston, Dropper. Just had that issue, It is lite loader that is causing that..